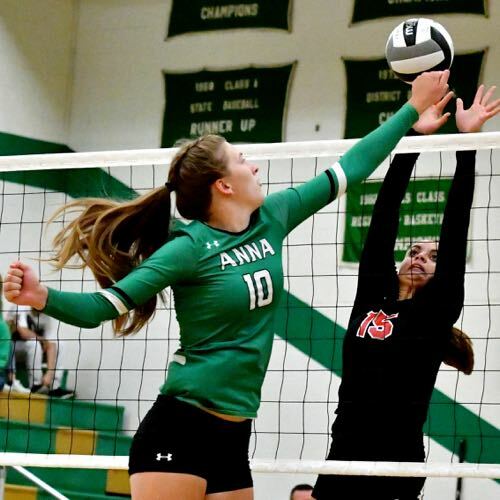 Up two games to one, Fort Loramie’s finishing woes continue as Anna stages a spirited comeback in the final two games to beat the Redskins in five. Well, not so fast, my friend. And ask Fort Loramie coach John Rodgers about putting it the board too soon. 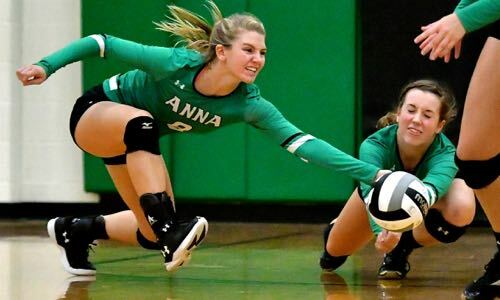 Because for all the world it looked as if Rodgers’ Redskins (5-5) were about to do just that Tuesday, leading two sets to one in their SCL match at Anna…but no one told the Rockets. ABC…A little alphabet with your volleyball? 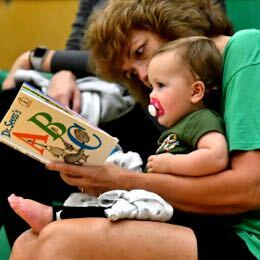 Kelli Zumberger’s kids came off the mat to take the fourth, and then the deciding fifth in thrilling fashion, and won – 25-23, 22-25, 19-25, 25-21, and 15-12. 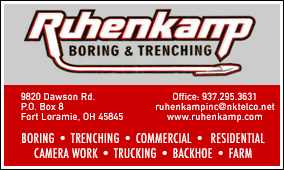 Exhilarating for the Rockets, who lost to Jackson Center last week and Marion Local over the weekend – and heart-breaking for Rodgers and the Redskins who saw their habit of letting their foot off the gas when they were driving an opponent continue. “Wow, that’s a hard one to lose, and we’re losing too many like that,” said Rodgers, post-game. 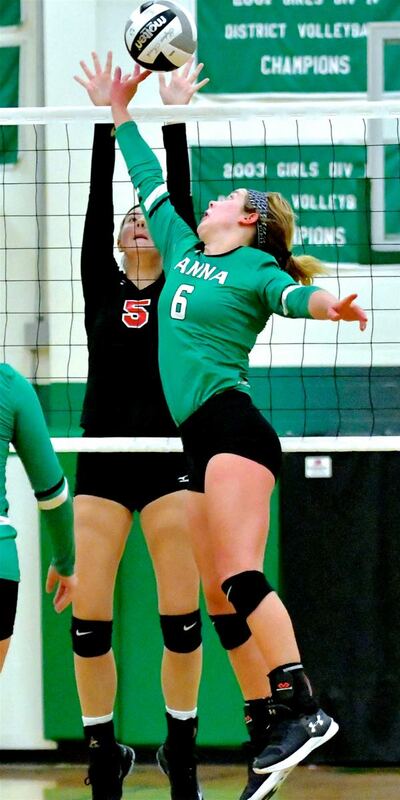 Anna’s Mary Landis helps save a point in Tuesday’s win over Ft. Loramie. “I told the girls…you gotta’ learn how to win, or another failure to finish, however you want to put it. We just have to learn to win down the stretch. I can’t take away from the good things we did tonight…we played well. We really played well. Except for the first five or six points of the match and the last four or five points of the deciding game…we were fine. But in between those two bookends I have no problem with my team. The opening game was a see-saw affair that saw unforced errors – missed serves and easy balls hit out of bounds – haunt Loramie with the two-point loss outcome. Too many easy points surrendered. But just as quickly, Rodgers and the Redskins came back to win successive games in the second and third by correcting those same flaws. Then, whether by complacency or fatigue (no one mentioned it), somehow the Redskins (5-5) had a familiar late-match lapse, similar to earlier losses to Russia and Jackson Center just a week ago. Anna, on the other hand, surged! Anna’s Lauren Barhorst tips the ball over Loramie Alyssa Wrasman. 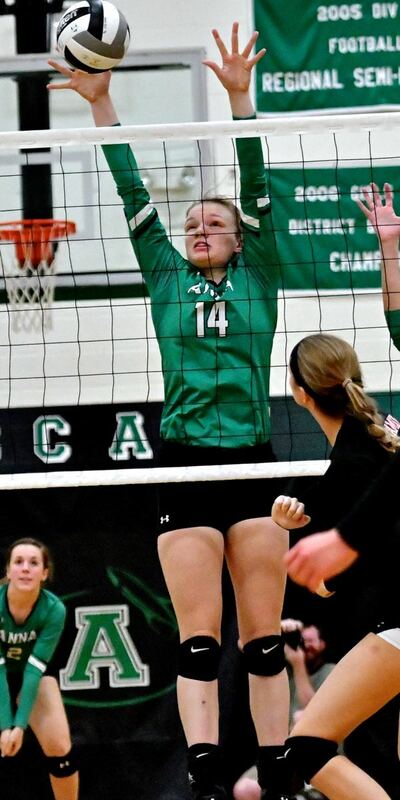 The Rockets hustled their way to a 25-21 win in the fourth set on spirited play at the net and some extended points that seemed to take the starch out of Loramie. And by the start of the fifth set, you could feel the noose tighten on the Redskins’ bench. They got out to a short lead at 4-2, but Anna quickly closed the gap and tied the game at 6, 10, and 12. Then, senior Sierra Williams put down a brilliant block at the net on a shot attempt by Marissa Meiring for the 14th point. And a moment later, Lauren Barhorst closed it out with a kill that handcuffed the Redskin defense – and it was game, set, match. “Huge win for us because our girls really showed some grit tonight,” said Zumberger. “There were moments early when they looked down, but then at one point our captains took the reins and said, ‘You know what, we can come back.’ And that’s pretty much what we did. 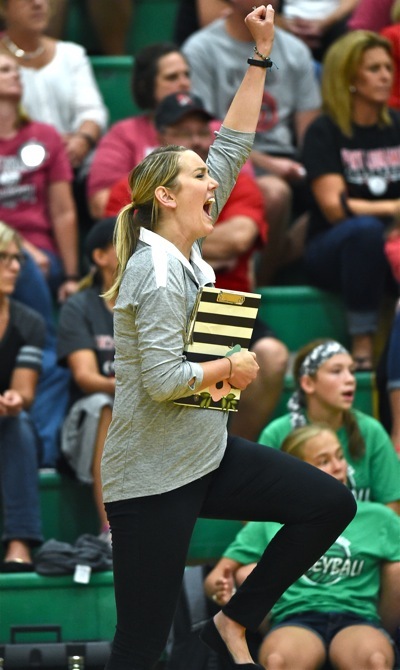 Anna coach Kelli Zumberger cheers match point, 15-12. The Rockets won by overcoming a lot of silly mistakes early, similar to how Loramie started – ball hit out of bounds and serves into the net. With the win Rockets improve to 8-4, but more importantly, they hope it gives them some momentum for the second trip through the Shelby County League schedule…and the remainder of their season. And they’ll need it. They play non-league New Bremen on Saturday, and then of course, another dose of Russia, Loramie, Jackson, etc., the second time around. A good time to get healthy, get the kinks out…and learn how to finish. You don’t put it on the board too quick. Welcome back, Lexi…Lexi Wells finesses a point over Loramie’s Jada Drees.